As Australia heads towards a possible double dissolution election on July 2, Deputy Liberal Leader Julie Bishop has sought to attack Labor’s economic record. 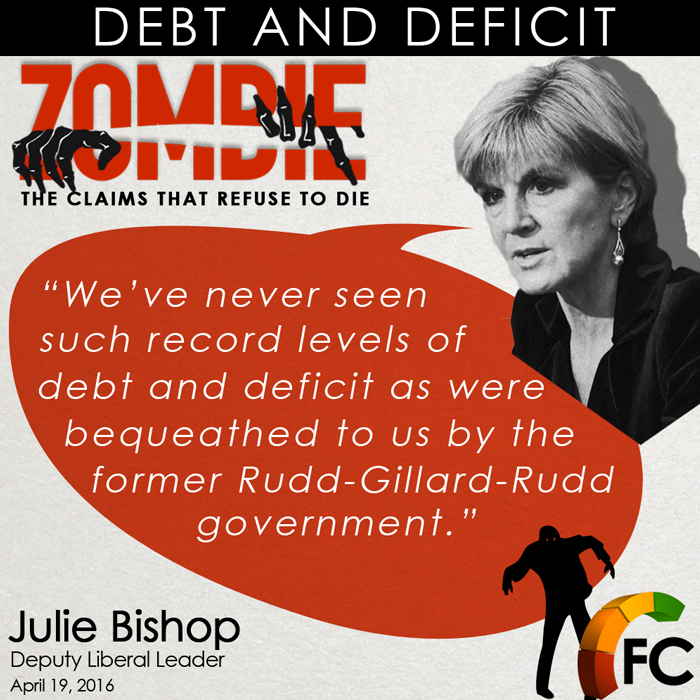 “We’ve never seen such record levels of debt and deficit as were bequeathed to us by the former Rudd-Gillard-Rudd Government, and Bill Shorten was part of all of that,” she told Sky News on April 19. It’s not the first time Ms Bishop has made this claim. She also made it in early 2015, when she referred to the Abbott government’s budget legacy from the previous Labor administration as “the worst set of financial accounts inherited by any incoming government in Australia’s history”. Fact Check found that claim to be wrong, but Ms Bishop has continued to repeat it. On a sunny morning in August 2011 Peter and I had morning tea in front of our house. We noticed a wild dove, who seemed to watch us, while she looked again and again towards a large bush. Was she thinking of building a nest there? We had found birds’ nests in the past in bushes near the front of our house. It was not like this with this bird. She soon took off to look around elsewhere. Suddenly we talked about the games we played as children. We were comparing our different attitudes to being left alone. I mentioned that I cannot remember ever having been distressed when I was left to do something by myself. I had my ‘Kinderzimmer’, where I was often supposed to play on my own. When I was all by myself, I liked to invent people who would talk to me. I totally accepted that not all the time someone could be with me no matter how much I loved to be surrounded by people. Many children my age and older lived in our street, the Bozener Strasse in Berlin-Schöneberg. The buildings in our street were five stories high. We all lived in rented apartments. Our street was very secluded with no traffic to speak of. We would play ball-games in the street. We also played singing games or games where we had to recite certain verses. I can still remember a lot of the songs or verses that went with our games! My Reply: “Thank you very much for visiting, Noeleen, and commenting. Making up people to talk to, isn’t that what we do when we write fiction? When real people talk to me, or I listen to others talking, certain conversations just stick to my mind and I reflect on them over and over again. When I was about five and we were celebrating grandfather’s 70th birthday, there was music and dancing. I happened to be outside in the entrance hall listening to the music and trying out a bit of dancing on my own. Uncle Edmund noticed me. He asked me what dance I was doing. I said: ‘Swing. I’m dancing swing. This is what Mum and Aunty Ilse are always dancing.’ Uncle E was rather amused. I am sure his face showed great amusement! It embarrassed me greatly. I think, this is why I never forgot this incident. Mum always told me I was not a very good dancer, same as my father. She called it ‘stiff’ dancing. I admired Mum and Aunty for being such good dancers. I longed so much to be able to dance like this! ‘I have now two pages about my childhood. One is just “Uta’s Early Childhood”, the other one is “Uta’s Early Childhood, Part II”. In the Part II I inserted today some pictures about my sixth birthday in 1940 plus one picture from summer of 1942. All these pictures were taken during the war, World War II that is, when we lived in Berlin, Germany. Did we suffer during the first years of war? I don’t think so. Except that my father had moved away from Berlin. He became the manager in grandfather’s furniture factory in Lodz, Poland, which since the German occupation in 1939 was called Litzmannstadt. My father had grown up in Lodz. His family had lived in Lodz since the early 1800s, when this part of Poland belonged to Russia. My father had studied in Leipzig, Germany. In 1930 he had married my mother in Leipzig. During the early years of their marriage they had for the most part lived in Berlin. Sometime during the early war years my father had some disagreements with some Nazi people he worked with in Berlin. I think he didn’t voice his disagreements publicly. Had he done so, he may have ended up in a concentration camp! On reflecting how children experienced the Nazi area in Germany, one book, that deals with this, comes to mind. I read it only recently. It is set in a small place near Munich in southern Germany. I lived near Berlin and in Leipzig during the last years of the war. So I have no experience what life was like for children in Bavaria during these war years in Nazi time. However what Markus Zusak tells us in his historical novel THE BOOK THIEF sounds absolutely believable to me. This article is about the novel. For the film adaptation, see The Book Thief (film). “The Book Thief is a novel by Australian author Markus Zusak. Narrated by Death, the book is set in Nazi Germany, a place and time when Death, the narrator, notes he was extremely busy. It describes a young girl’s relationship with her foster parents, the other residents of their neighborhood, and a young Jewish man who hides in her home during the escalation of World War II. First published in 2005, the book has won numerous awards and was listed on The New York Times Best Seller list for over 230 weeks. In reply to Robert M. Weiss. Robert, you are spot on with your overall view of history. I always say, that the 2nd WW was a continuation of WW I as it was finished in an unsatisfactory way. Meaning, nobody was thinking about the future. Versailles was a disaster. A much better solution was found at the end of WW II. The Germans, at the end of WW I, were hoping that Wilson’s 14 Points would be adhered to. As a result “The humiliation of the Treaty of Versailles”, as you say, led to the rise of Hitler. Cornish has been criticised too, but I found it an interesting read on a certain view point of history. Schopenhauer stipulates, that in a contest between “Will” and “Reason”, “Will” will always win. In reply to The Emu. The disagreement with the Nazis was on two levels: personal and about the conduct of war. Personal: When Hitler came to power he joined the party as a “good” public servant would. Later the life style of his wife could have headed for divorce. This was intolerable for the Nazis and they asked him to discipline his wife or he could not remain a member of the party. in which Goebels called for “Total War” to be waged. Uta’s father was of the opinion that it was pure propaganda. As an economist he could see that many mistakes were made and the German industry and population were not put on a war footing. He criticised the use of forced labour and called for the utilisation of German women in industry. Only 33% of women were working. Working women was an anathema for Hitler. He wrote a Memorandum to Hitler and for his effort was hauled in front of Martin Bormann, secretary of Hitler, who advised him not to insist on sending the Memorandum to Hitler. Instead they sent him to the “Ostfront” because he was a Russian speaker. This is the stuff novels are written about. A lot of what we know is only bits and pieces. Adults did not talk to children about it. Later, yes, but not all came to light. My response: As I said, my father left Berlin to become manager in grandfather’s factory in Litzmannstadt (Lodz). Towards the “Ostfront” he was sent later, probably in 1943. I remember we were visiting Dad and the Grandparents in 1940/1941. In August 1941 we were back in Berlin, but Dad stayed with his parents. Janusz Korczak was offered an opportunity to escape from Poland, but he did not take it. Instead, in 1942, he marched with his orphan children to the death camp of Treblinka…. No doubt people in great psychological need follow cults, and often utilize unhealthy coping mechanisms. What happens with countries brings matters to a larger scale, and nationalism has been responsible for many wars. The humiliation of the Treaty of Versailles, the rampant unemployment, and other factors went into the cauldron of Nazi Germany. Hitler’s genius was to work with the young people, and gain their support in actively supporting the Third Reich and its goals. By borrowing heavily from German mythology, Wagner, the concept of the ubermensch, Hitler instilled in the young a burning pride in Germany’s future. Hitler was also influenced by Schopenhauer’s “Will to Power”, the incendiary speeches of Bismarck, and the methods of American advertising… History is composed of a series of reactions and counter reactions. Perhaps one day we will succeed in isolating the variables responsible for the vagaries of history, and gain a more precise understanding of the historical process. ” . . . . nationalism has been responsible for many wars.” This is a known fact. Still, leaders don’t want to learn from this and continue to promote it. Will there ever be a time when mankind can live in peace without any wars? Maybe if there’s an outside threat we’ll then be acknowledging our common humanity. So he marched to the death camp with his children . . . . . I wonder how many children were with him. Is it that the Nazis rigorously went to eliminate everything that seemed foreign to them?Do a lot of people to this day have an innate fear about this what doesn’t fit into their view of the world? I think not many people are interested in understanding the historical process. They are just interested in how they see their own little world, which is an island surrounded by things that frighten them. Does this lead to fundamentalism? Can fundamentalists live peacefully together with non-fundamentalists or other fundamentalists? If they don’t want peace, what do you do? Eliminate them? Every religion teaches you not to kill unless you are attacked. So for instance Talibans want to kill us. So we are allowed to kill them. Aren’t we? No objections to killing Talibans. Too bad if a few other people get killed along the way. And so it goes. No wonder I need prayers to stay sane. Because the historical process goes on whether I like it or not. Very interesting Auntyuta, to read of your background in those years, virtually a first hand account and must be recorded and handed down into your family and put into book form. It intrigues me as to the disagreement your father had with the Nazi;s, maybe you could elaborate on this Auntyuta. Submitted on 2013/05/20 at 3:10 pm | In reply to The Emu. Ian, this recovery program helped Germany enormously after WW II. Whereas what happened after WW I was a terrible disaster for Germany. The result was that the Nazis came to power! The disagreements my father had with the Nazis had to do with the war. But sorry, I cannot recall properly what my father said about it. Anyhow the way I remember it, my father was objecting to the way the war was conducted. I think he moved to “Litzmannstadt” towards the end of 1940. This for instance would have been long before Pearl Harbour! For a great part of 1941 we stayed with the grandparents in Poland. By August 1941 we were back in our apartment in Berlin (without my father of course). In September 1941 I started school. I was then aged seven already! My second brother was born in October 1941. My first school reports say my father’s occupation was “Betriebsführer” (Manager). He was born in 1904. During the first war years he was regarded as being too old to be conscripted. But by 1943 his year, that is men having been born in 1904, were being called up for military duties. After some training my father was made straight away to be an officer. He was sent to the Eastern front. He came back from the war with his health ruined. For many years after the war he suffered from these health problems without getting any support from my mother I might say. But his sisters and the sisters families as well as his mother who were all refugees from Poland, well everyone in his extended family supported him to the best of their ability. Eventually he did recover and was able to get full employment. Soon after the war my parents separated, Only in 1949 my mother got a divorce from him. In the 1950s when he was gainfully employed again and his health had improved a lot, he asked my mother to marry him again. She refused. He married his secretary in 1959. In 1966 he died of prostate cancer. Submitted on 2013/05/20 at 7:46 am | In reply to Robert M. Weiss. Hi, Robert, I have the feeling what you say about Hitler may be absolutely right. My generation (after all I was only a child during the Hitler years) on the whole has learned not to trust people like this. Aren’t there certain people around in certain countries who somehow are able to get followers when clearly if they only started thinking a bit for themselves maybe they couldn’t be followers? Sadly people in general go more by their feelings and what’s in it for them rather than thinking about the consequences of their support. Aren’t most people selfish? If something is promised that advances them they go for it, don’t they? I guess Janusz Korczak was a remarkable educator, right? I think you mentioned him in one of your blogs. But I can’t recall any details. Did he for instance survive the war years? Did he have family? It is of course admirable if people stand up for what they believe in. The best example where protests by a lot of people resulted in an immense change happened in the Eastern part of Germany. The fall of the Iron Curtain, which for years and years looked rather impossible, all of a sudden was possible in a rather peaceful way. That it went ahead peacefully was thanks to some noble people who restrained themselves from interfering. War and Peace, War and Peace, maybe this is the fate of mankind for ever and ever. Didn’t Orwell say, some people when they say peace mean war? Our previous Primeminister Keating here in Australia used to fight a lot in parliament. His attitude was it was better to fight in parliament rather than attack each other in the street. Many people at that time didn’t voice their opinions openly. Janusz Korczak, the Polish educator, did. He walked through the streets of Warsaw wearing his Polish army uniform, and was put in jail for his efforts… I continue to be amazed how the Germans could have supported such a madman as Adolf Hitler, which he clearly was. He misused Darwinism, Nietzsche, and never followed his main tenet: to produce children for the Fatherland. Perhaps he knew that that he was the most misbegotten cross and handicapped person of them all. Yes, do please write about your childhood. It was so different then, and personal memories make it come alive for our children and grandchildren. My early life in England (1940’s and 50’s) seems like tales from a distant planet when I reminisce to the kids! Hi Diana, thanks for the comment and welcome to my blogging. I read your about page and am interested in what happened to you when you turned forty. I remember, a long time ago when I turned forty my life seems to have undergone some kind of a change. A lot of the subjects you write about look very interesting to me. I want to do some reading of your blogs pretty soon. You got a lot of interesting comments on this article Uta, I do recall this post, the comments illustrate the interest in this part of your life and this part of history in general. These memorys must be recorded while you can, as overtime history does get altered to suit the imaginations of the reader in recorded history. Thank you so much for coming back to this story, Ian, and commenting on it again. At the moment my head is full of reviews to the book “Before I go to Sleep”. I googled all these reviews and spent quite some time reading them. At the moment I took a break from reading. Having seen the movie today with Peter we did discuss the story quite bit. The acting was superb: Colin Firth and Nicole Kidman at their best! If the story is supposed to be a real life story, there were a few things that did not make real sense to us. We happened to mention it to the cinema owner and he suggested that maybe in the book there would be some more clues. Not having read the book yet but having looked up a number of reviews about it I am more or less informed now about a few more details. However it makes me wonder how often in the real world people are being lied to and don’t know whom to trust, and how often it is easy for criminals to escape prosecution because the police or the medical profession do not follow up on any given clues? To me the whole thing is a human relationship story. How people relate to each other I always find most interesting. .This is a reflection on my parents. Their marriage their frequent separations, their divorce, how they related to us children, their interests, their friends or partners, Dad’s second marriage. When I was about fifteen, Mum introduced ‘Bambi’ into our lives. ‘Bambi’ was Herr Burghoff aka Tomscick. Of course only Mum called him ‘Bambi’. To us children he was ‘Herr Burghoff’. We did not have any problem with this. Later on I found out that Dad had a problem with calling him by his adopted new name. Dad insisted on calling him ‘Tomscick’. It was June 1953. I was on a one week leave from FLEUROP and had used this, my very first vacation, to visit Dad in Düsseldorf. ‘The boys told me that Tomscik never shared his supper with you children,’ said Dad. ‘And what is this, that he wants to marry Mum?’ asked Dad. ‘Yea, by declaring the marriage invalid and my children bastards,’ screamed Dad. Dad looked extremely upset. ‘That’s absolute nonsense!’ he shouted. Dad nodded. He knew all about this: Mum had always refused to leave Berlin to live with him. Mum actually never re-married. An acquaintance of Mum’s helped her to acquire a permanent job in the Berlin Rathaus (Council Building). She worked there till she turned 65. She could have stopped working earlier, however she knew her pension would increase if she worked to age 65. She lived for her twice yearly vacations. She always saved up for these vacations to go on wonderful holiday trips. On one of these trips she met a widower who was keen on marrying her. Years later she once told me, she chose not to marry him. He was elderly and she was too scared he might eventually need nursing care. The thought of having to nurse someone in old age just didn’t appeal to her. She thought she deserved to have the opportunity to still have a bit of fun in life. On each holiday she took lots of photos and meticulously preserved them in photo albums. She also wrote a few comments for every trip. There are some records in her recollections about two very elegant men who invited her for dinner. These men turned out to be homosexuals who greatly enjoyed the company of a well groomed presentable lady. And apparently she enjoyed being invited and appreciated. She told me she was glad that none of them expected any sexual favours from her. In June 1935 we went for a visit to Lodz in Poland, where Dad’s parents and all his brothers and sisters lived with their families. Dad’s sister Elisabeth (Lies) and brother-in-law Alfred Häusler owned a property near Lodz. This is where this picture of me was taken. I am probably not quite 10 months yet. Beneath is Dad’s passport which included Mum and Baby Ute (Uta). Back to the story about my parents. I don’t know whether Mum would have paid any attention to what I could have been saying. I always had the feeling I could not talk to Mum about these feelings. It was very different with Dad. He always wanted to hear my opinion on everything. Anyhow as it turned out I left old Germany a few years later with my husband and two young children. Dad was quite devastated to see us leaving. He had become so attached to his first born granddaughter Gaby. She gave him such great joy! We were soon well and truly settled in Australia. We felt Australia was for our young family much better than Germany. We never regretted having left Germany behind. Dad’s secretary, Frau Kusche, was a war-widow. She came from Lodz in Poland the same as my Dad. She had raised a son and a daughter as a war-widow. I had seen Frau Kusche only once briefly at the office. I later heard her 28 year old son, who was married and also had a little son, this 28 year old was suffering from terminal cancer. Before he died he was witness at the marriage of his sister who had been an air-hostess and was marrying an American. My father, who had married Frau Kusche in the meantime, was also present at the wedding, together with his new wife of course. Frau Kusche’s first name is Gertrud.. Dad had a few good years with her towards the end of his life. He too, sadly died of cancer when he was only 62. He and G made a few visits to America to see G’s daughter there. They had also planned to come and visit us in Australia. Sadly, this never eventuated. G. was looking after Dad when he was terminally ill. It took a lot out of her. But she recovered eventually. She’s still alive and well now, being in her nineties, her daughter-in-law is keeping an eye on her. Your parents were victims of the political reality and the war in Germany. It is hard to say what would have happened to them without the war interfering in their lives. Having known both of them I venture to say they were not suited to each other in any case. You may be right there, Berlioz. Thanks for commenting. It is amazing that Frau G is still alive so there is someone who you may share memories of your father with. It is sad about your parents separation. However, you have weathered the storms well and set your own firm roots with your own family tree growing strongly here in Australia. Our family tree is indeed growing strongly here in Australia, Elizabeth. Of course, I do like this very much. I saw my mother in 1994 shortly before she died. With G I have some contact per e-mail and photos. We saw her in Duesseldorf in 1986. I would have liked to see her again last year when Peter and I were visiting Berlin. We also stayed for a while with my brother Peter Uwe in Meck/Pom (north of Berlin). Other than that we went to my cousin’s funeral in Munich. But sadly we were not able to travel to Duesseldorf as well. It would have been lovely to see G again. However it was good to see her in 1986. She told us a lot about her life with my father. Telling that story must have brought back many memories. Thank you for sharing it with us. Your memory is alive &amp; well, Aunty Uta. There is heaps of detail here. How interesting your dad was so open to your opinions – I like that. As I grow up (;-) I discover that families the world over and through the centuries have been weird. Just plain weird! It’s a good thing to know. More kids should recognize this fact so they wouldn’t feel so isolated by the facts of their families. Quite amazing, Linda, isn’t it? What exactly do you mean by ‘weird’? Families that are somehow ‘dysfunctional’? What about divorce? Hasn’t this been on the increase in our time? Maybe it has partly to do with the increase in life expectation? In any case I believe it is important for children to know who their parents are. Whether they stay through all their growing up years with one, two or none of their parents this is a different matter. Some parents might not be the best option for a child, but the same goes for some institutions. It all depends. I did get to know during my growing up years some very well functioning families. I am talking about our extended family and about the families of some of my friends. I also saw examples of desperately struggling war widows with for instance four children and a bone breaking job with very little money. When I was a child a lot of people seemed to blame WW II for the increase in dysfunctional families. HOW DID WORLD WAR TWO AFFECT US? Reading these articles prompted us to think once more about how WW2 affected us. We both came to the conclusion that we did not experience anything that would have caused us some trauma. Both our fathers survived the war, but we agreed that both our fathers most likely would have gone through traumatic experiences during the war. Both our parents’ marriages ended up in separation and divorce after the war. Matthias Lohre writes about how badly millions of people had been affected by the War. Yes, millions and millions of people. And a lot of readers wrote comments on this subject. I read only a few of the comments, there are just too many. But just reading some of the comments, one becomes aware how badly even second and third generations have been affected by the traumatic experiences of their parents or grandparents. Even if Peter and I have not been affected personally by traumatic war experiences so I must say that as children and later young adults we were very much aware how much suffering the war had caused. Some families were totally or nearly totally wiped out because of the holocaust, military casualties or bombing raids on civilians. o All survivors from families with such traumatic experiences were experiencing trauma themselves and even the next generation became very aware that the parents were affected by war. I wonder, how many people, alive today, have never been affected by war? Wars continue to be fought in a lot of countries and a lot of continents. The refugee crisis is now worse than ever. Is mankind going backwards? The few people, who are not affected by wars, do they not ever consider how wars affect the rest of humanity? For as long as some of us can live in peace, we do not care what is being done to the rest of humanity? How can we be so selfish? Has it just got to do with a survival wish? Or is it just a feeling that we have no power to stop wars? But at least we can voice an opinion that we do not want all these wars, can’t we? I really do wonder whether mankind has any chance that some true peacekeepers with a lot of power will come to the fore once more to stop all this fighting! Well, for as long as there is life, there is hope! Or is there?